This year we celebrate the 300th birthday of Lancelot “Capability” Brown. His precise birthday is unknown but he was baptised on 30 August. An English landscape architect, he earnt the nickname “Capability” because of his ability to assess the “capabilities” of the natural landscape: so it wasn’t, as one might assume, Brown himself who was “capable” or “gifted” but the landscape itself that had the “capacity” for improvement. Brown was immensely sought after by landed families and in 1764 was appointed King George III’s Master Gardener at Hampton Court Palace. Numerous examples of Brown’s work can be found in Hampshire. 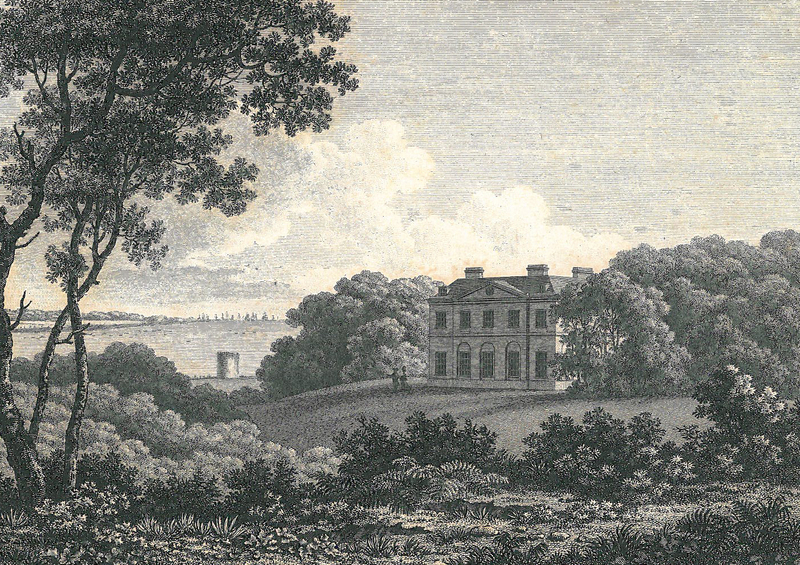 In 1767 he begun a major architectural transformation of the Broadlands estate near Romsey; the work was later completed by architect, and Brown’s son-in-law, Henry Holland. 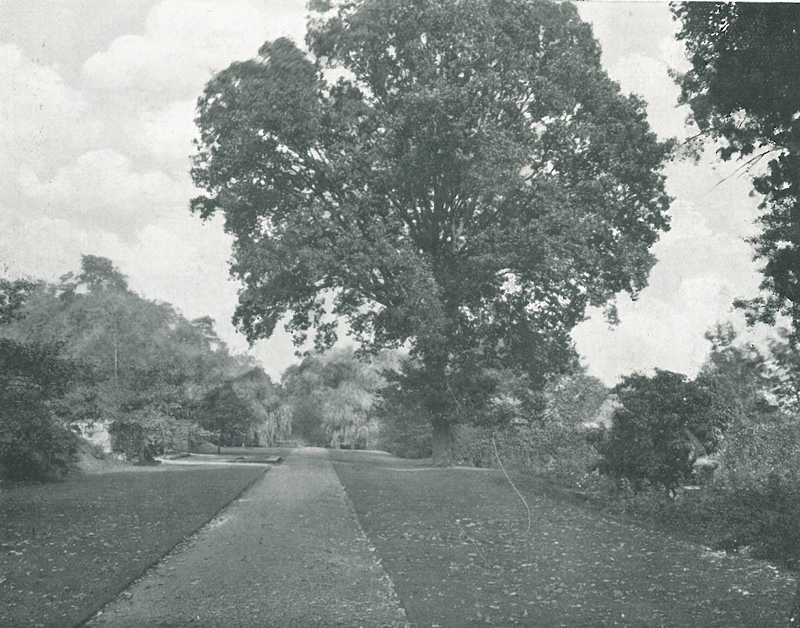 Broadlands was not the only Hampshire estate on which Brown applied his landscaping genius. Hans Sloane inherited the estate of Paultons Ower, near Romsey, from Hans Stanley in 1780 and changed his name to Hans Sloane Stanley as a sign of gratitude. The estate, now covering 3000 acres, was modelled and designed by Capability Brown in the eighteenth century. The park is now better know as the home of Peppa Pig World. 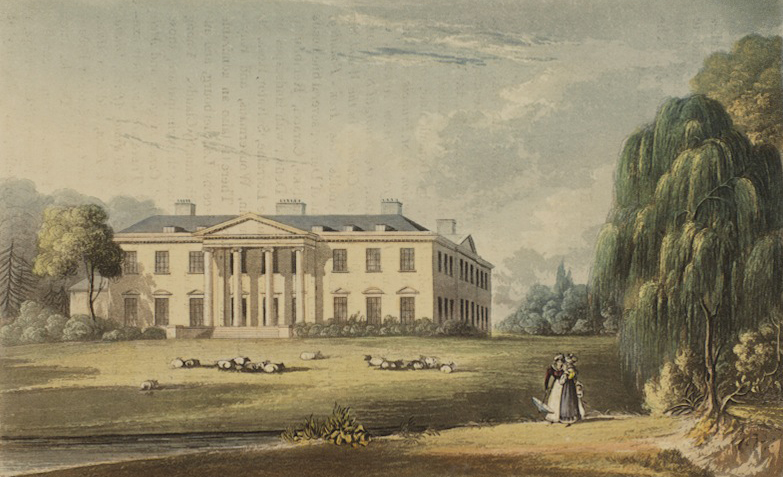 South Stoneham House in Swaythling was once the seat of the Barons Swaythling. The building is currently owned by the University and until recently was used as a hall of residence. The previously formal grounds were landscaped between 1772 and 1780 by Capability Brown at a cost of £1,050. 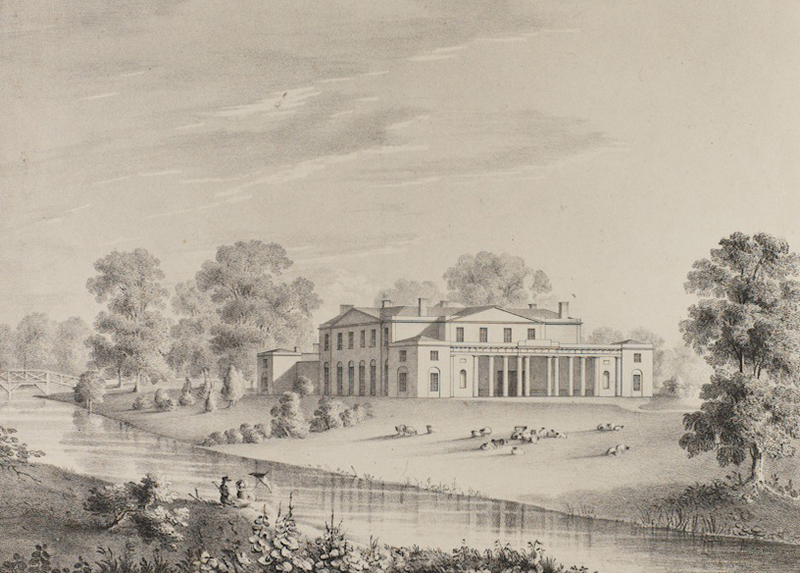 In 1819 it was bought by John Willis Fleming, who also owned the manor of North Stoneham the location of yet another of Brown’s landscape projects. The original Cadland House was built in the late 1770s for Robert Drummond, a member of the prominent banking family. Designed by Henry Holland, it had a landscape park laid out by Capability Brown, which included a fishing lodge surrounded by an eight acre garden. In the late 1940s, the house was demolished to make way for the Fawley Oil Refinery. The present Cadland House stands on the site of the fishing lodge and its garden, one of Brown’s smallest designs, has recently been restored. Highcliffe Castle was built between 1831 and 1835 by Lord Stuart de Rothesay within the grounds of High Cliff, a Georgian mansion designed for the 3rd Earl of Bute, grandfather of Lord Stuart. High Cliff was built between 1773 and 1787 and Capability Brown was involved in some part with the design of the grounds. 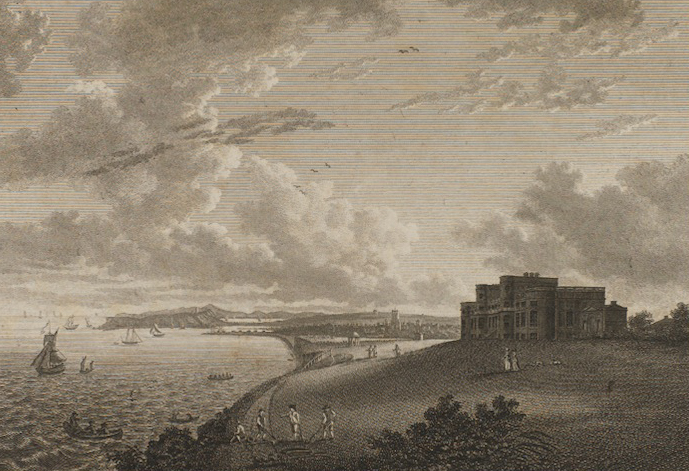 High Cliff was one of only two Capability Brown seaside sites the other being Cadland. Both of these sites were in Hampshire but in 1974 the County boundary was moved eastwards, thus placing the earlier “Brown” park and its successor house, Highcliffe Castle, in Dorset. There are numerous events taking place as part of the Capability Brown Festival 2016 including Capabili-Teas, talks, tours, conferences and family-friendly events. A textile exhibition on a Capability Brown theme will be on display at the Sir Harold Hillier Gardens until October. Next week marks thirty years since the first World Archaeological Congress took place at the University of Southampton. In our latest blog post we take a brief look at the controversial events leading up to the conference. The World Archaeological Congress (WAC) began life as the 11th Congress of the Union Internationale des Sciences Prehistoriques et Protohistoriques (UISPP), an affiliate of UNESCO and recognised by the latter as the official body of world archaeology. The 11th Congress of UISPP was set to take place in Southampton in September 1986, with the responsibility for organisation delegated to a British national committee. However, as preparations were underway, growing violence in South Africa midway through 1985 brought heightened awareness to the issue of apartheid. 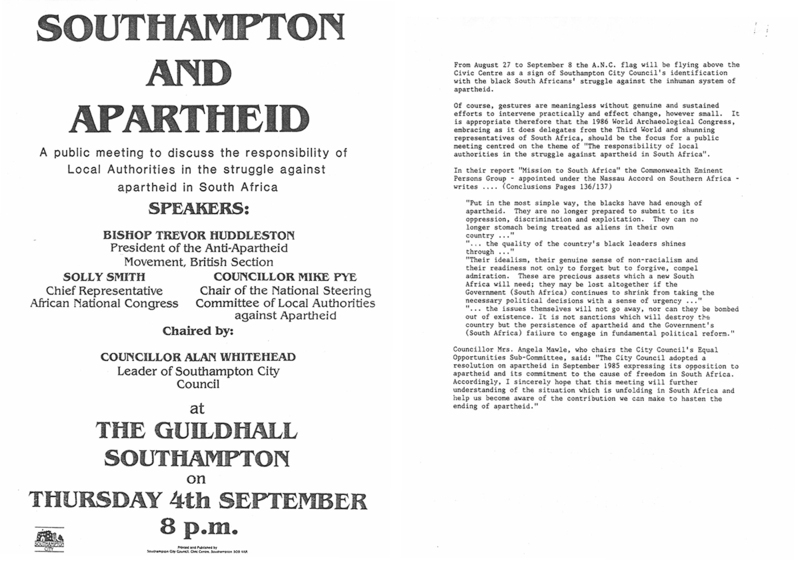 This led to pressure from Southampton City Council and other organisations funding the conference to impose a boycott on South African participation. The decision of the British organisers to implement the ban led to UISPP refusing official recognition of the conference, citing the case as one of academic freedom. The decision received considerable coverage in both the popular and scientific press and resulted in a series of resignations and withdrawals. It also led to a significant split of opinion among the academic community with a number of open letters circulated arguing both for and against the ban. Despite these setbacks, Professor Peter Ucko, the National Secretary of the Congress, insisted on moving ahead under a new name: the World Archaeological Congress. The first WAC was held in Southampton from 1-6 September 1986. It drew in 1000 people from 100 countries, with special efforts made to provide a more open and inclusive platform and encourage indigenous people from underdeveloped countries to attend. The conference also brought into stark focus the idea of archaeological ‘objectivity’, challenging the orthodox view that the profession was either above or outside politics. The success of the conference has since enabled the WAC to continue to promote openness, inclusivity and diversity through a series of major international conferences held every four years. These have included WAC-2 in Barquisimeto, Venezuela in 1990; WAC-3 in New Delhi, India in 1994; WAC-4 in Cape Town, South Africa in 1999; WAC-5 in Washington, D.C., USA in 2003; WAC-6 in Dublin, Ireland in 2008; and WAC-7 at the Dead Sea, Jordan in 2013. However, subsequent conferences have not been without political and social complications, with organisers of WAC-3 in India being heavily criticised after a controversial decision was made to ban discussion of the recent destruction of the Ayodhya mosque. The WAC has also sponsored a series of regional thematic Inter-Congresses, including ‘Archaeological ethics and the treatment of the Dead’ in Vermillion, South Dakota in 1989; ‘Environment and Archaeology’ in Puerto Rico in 1992; ‘Urban origins in Africa’ in Mombasa, Kenya in 1993; ‘Nomadism – Past, Present in Global Context and Historical Perspective, The Phenomenon of the Hsiung-Nu’ in Buryatia, Russia in 1996; and ‘The Destruction and Restoration of Cultural Property’ in Brac, Croatia in 1998. 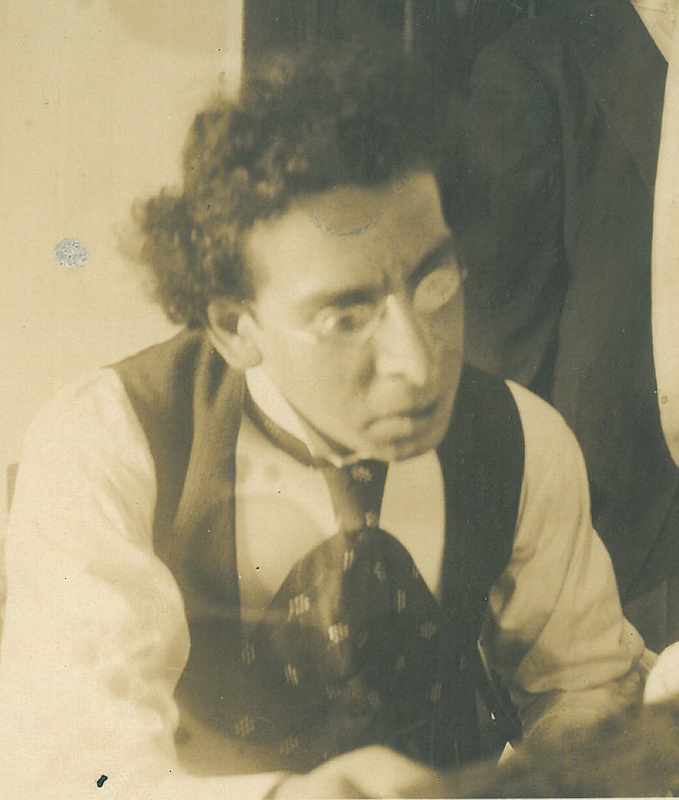 Special Collections holds two collections relating to the WAC: the papers of Peter Ucko (MS 406 A928) and the papers of Peter Stone (MS 406 A4167). Peter Stone was project manager and co-ordinator of the Archaeology and Education Project at the University of Southampton from 1985 to 1988. During this time he was heavily involved in the creation and development of the WAC, acting as Honorary Chief Executive Officer between 1998 and 2008. His recently catalogued papers contain a range of material relating to organising several of the international conferences and inter-congresses, with a particularly significant amount of material focusing on WAC-1. The papers include correspondence, minutes of committee meetings, articles, press cuttings, promotional material, programmes and pre-circulated papers. 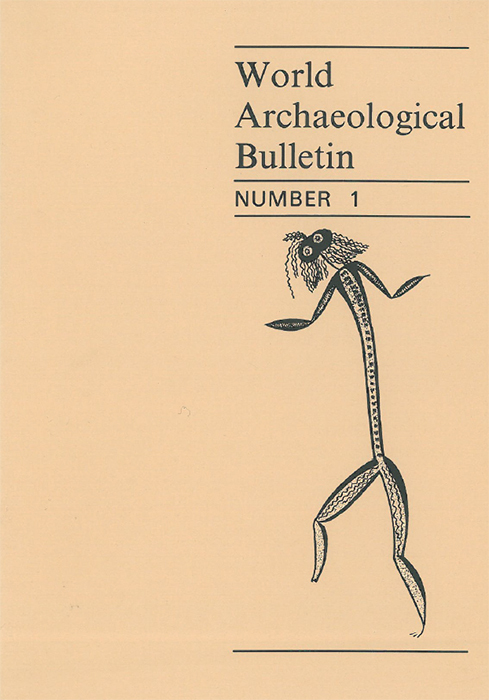 Other material in the collection includes WAC publications such as WAC News: The World Archaeological Newsletter and the World Archaeological Bulletin, the first edition of which focused on the issue of academic freedom, particularly in terms of its relationship to apartheid and archaeology. WAC-8 is set to take place in Kyoto, Japan and will run from 28 August to 2 September 2016. 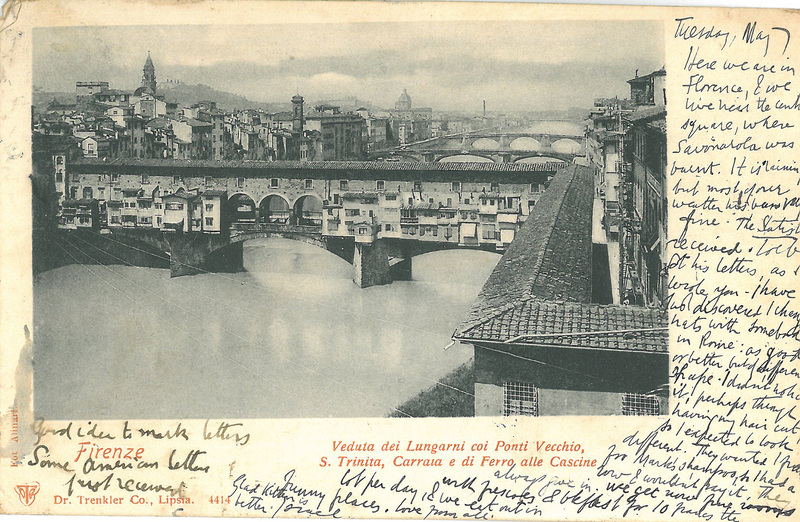 This week, a recently catalogued item in Special Collections has set us thinking about summer travel abroad – in the past as well as the present. 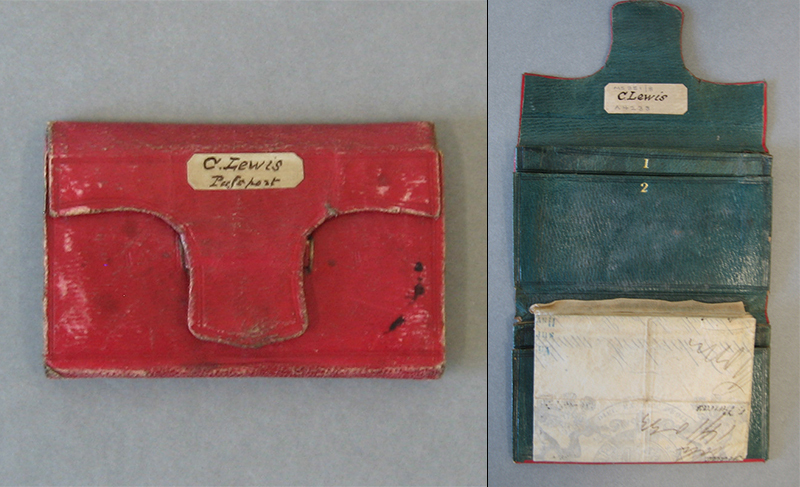 Hidden inside this brightly coloured wallet is a nineteenth-century British passport. It is a far cry from our modern passports – the familiar booklet of paper pages complete with photo and description. Instead, this is a single sheet of parchment, bound in linen at the edges, carefully folded, and stitched into a leather-covered wallet. Aachen, or Bad Aachen, lies today in North Rhine-Westphalia, Germany, near the Belgian and Dutch borders – the Dutch know it as Aken – the French as Aix-la-Chapelle. It had been occupied and annexed by the French in 1801, and passed to Prussia in 1815, but its significance stretched back beyond the days of Charlemagne – whose palace was here and whose tomb lies in the magnificent cathedral. From the 1830s it was also part of a growing railway network – was Charles passing through on his European travels or was Aachen his destination? Famous for hot springs from Roman times and a popular spa town, Charles and his wife may have been enjoying a holiday here. 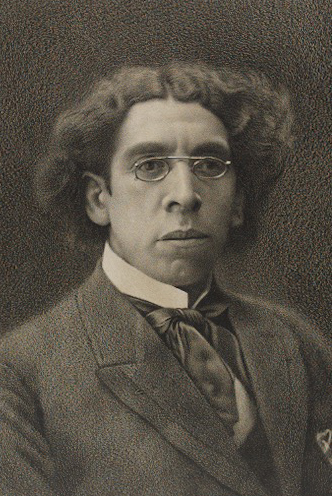 Who was Charles Lewis? We don’t know: we are told that prior to World War I the possession of passports was largely confined to merchants and diplomats. 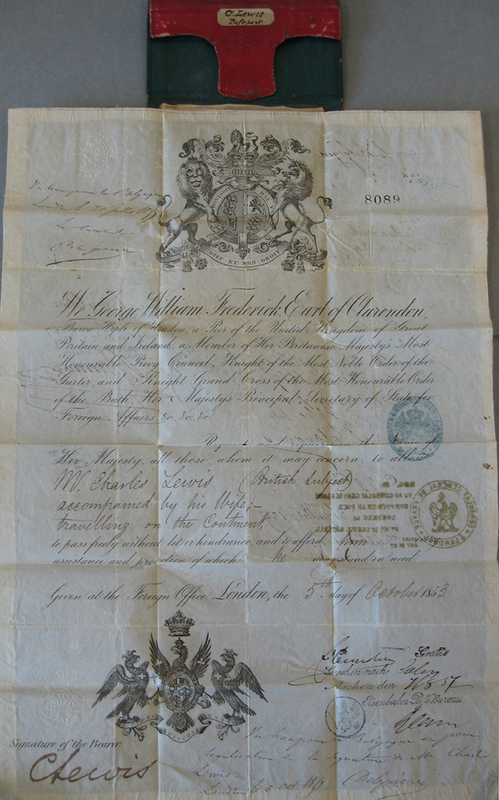 By the 1850s, when Charles made his journey, those applying for passports had to be relatively well connected and well-heeled, in order to be able to afford the necessary fee and to supply a reference. You can see Charles’ signature on the lower left-hand corner, as it was a legal requirement that the passport was signed. Wellington’s comments reflect the general dislike of the ‘passport system’ which was seen as bureaucratic and costly by the public, but there was also a resentment at the very idea that an English gentleman might need permission to travel – or be required to produce a document to establish his good name and character in the eyes of the world. Whatever the wider debate, we do know that Charles Lewis went to some effort and expense to obtain his passport, and that its value ensured its survival. The British have a nostalgic love for the “traditional” seaside summer holiday, with its images of building sandcastles, donkey rides and ice cream, together with the stroll along the promenade and the sound of the brass band mentioned in the popular Edwardian musical hall song I do like to be beside the seaside. 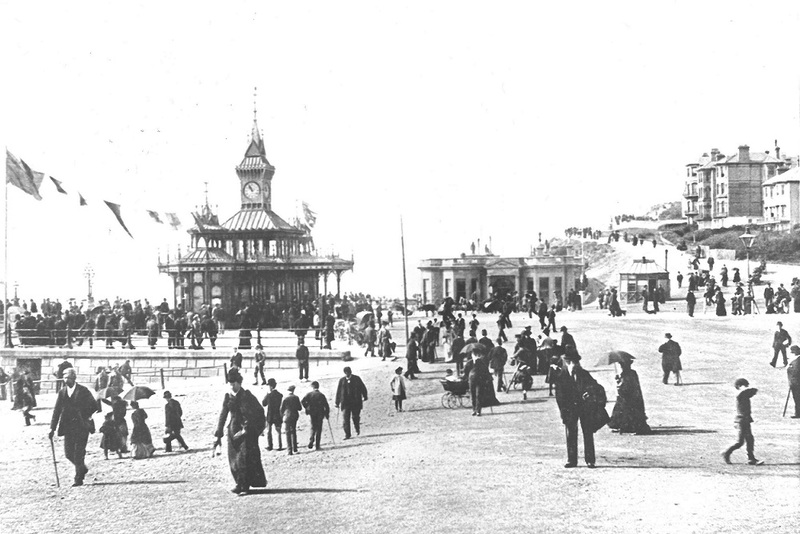 Most of these attributes associated with a seaside visit can be traced to the Victorian period, for it was in the 1860s and 1870s that the development of English and Welsh seaside resorts, including Blackpool, Llandudno and Brighton, began on a grand scale. 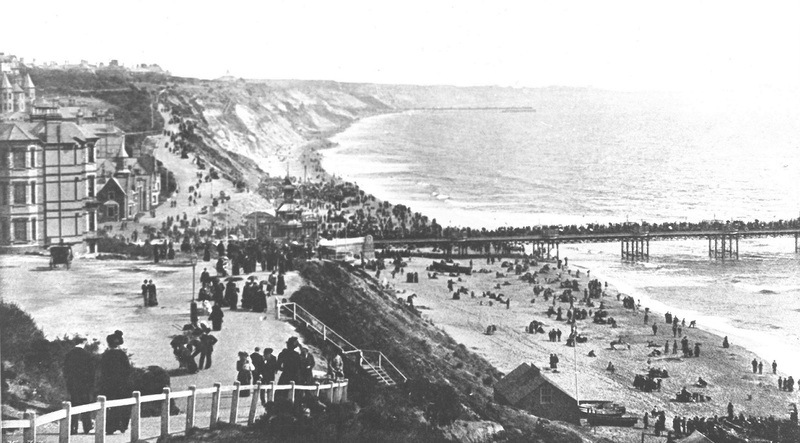 The expansion of the railways by the latter half of the nineteenth century allowed speedy travel to the seaside. 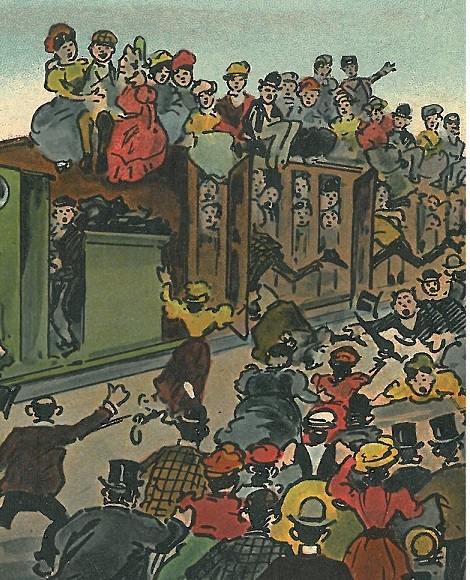 The 1871 Bank Holidays Act, introduced by the Liberal MP John Lubbock, provided working class with leisure time in which to take a day trip to the seaside. August bank holiday, one of the days officially designated by the Act, became a popular holiday from the mid-1870s onwards. Queen Victoria and Prince Albert shared with their subjects an appreciation of the seaside. The royal family spent their summer holidays at Osborne House on the Isle of Wight, with access to a private beach. Indeed, the beach at Osborne Bay was reputedly one of the main reasons the royal couple purchased the house. “We drove down to the seashore and remained there for an hour playing with the children who were so happy”, Queen Victoria noted in her journal in 1846.